They say an old dog can’t learn new tricks—but don’t tell that to Wacom. The company’s newest revision of its Intuos graphics tablet line, available Thursday, has not only been resdesigned; it now offers full support for multitouch gestures. Like its predecessor, the Intuos5 is available in three sizes—small, medium, and large—and features the same 2048 levels of pressure sensitive pen input along with a customizable row of ExpressKeys. There, the similarities end. The new Intuos design is sleeker (and a little bit longer); its exterior frame and ExpressKeys are covered in a smooth matte rubber. Rather than frame the tablet’s drawing area exactly, the tablet opts for a thinner rubber bezel, marking the sensor edges with glowing corner marks. 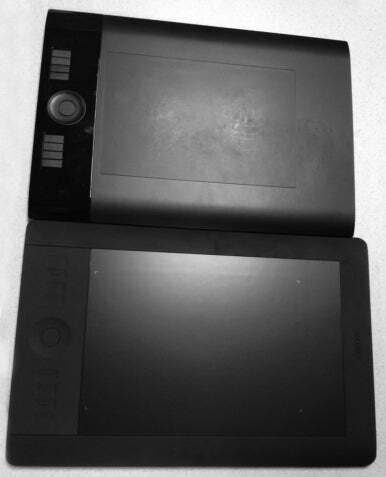 Wacom Intuos4 (top) vs Intuos5 (bottom). It’s in the ExpressKeys that the Intuos’s design meshes with its big new feature: touch. The tablet’s clickable buttons are gone, replaced with eight rectangular sensor areas and a touch wheel. When connected to your computer, you need only brush your finger against an area to have Wacom’s new Heads-Up Display (HUD) pop over your current window; it keeps track of what button is assigned to what function, and gives users a quick shortcut to the preferences panel. Lightly touch your finger on one of the ExpressKeys to bring up the new Heads-Up Display (HUD). Touch isn’t limited to buttons and wheels, however: The entire active area on the Intuos acts like one giant Magic Trackpad, where users can scroll, mouse, zoom, pinch, or swipe. The tablet supports all major system gestures for both OS X and Windows. In addition, you can create customizable three-, four-, and five-finger gestures for a keystroke, the tablet’s radial menu, opening or running an app, viewing the desktop, or Photoshop or Painter shortcuts. All Intuos5 models come equipped with multitouch functionality in addition to Wacom’s traditional pen input. These models also have a wireless option via the company’s Wireless Accessory Kit ($39), which uses an RF connection to let you draw and mouse without the need for a USB cable. In addition to the hardware, Intuos5 users also receive licenses for Adobe Photoshop Elements 10, Smith Micro Anime Studio Debut, Autodesk Sketchbook Express, and Nik Color Efex Pro 4.0 Select. You can pick up the new models from Wacom’s website or any of the company’s authorized retailers; prices are $229 for the small, $349 for the medium, or $469 for the large model.